Art is my preferred hobby and entertainment; the Biddington's family gene is inescapable. Unfortunately, volatile stock markets and late night rendezvous don't leave much time for reading and connoisseurship. So, I've learned to borrow the knowledge of well-educated friends to buttress areas where I'm lacking. One of my favorite human resources is Laura Shechter, a contemporary realist painter and National Academy member. Shechter studied with painter Ad Reinhardt who was, from all accounts, one the most brilliant art teachers of the 20th century; she has traveled extensively and possesses multi-cultural aesthetic knowledge. Shechter took minimalist Reinhardt at his word when he suggested distilling ideas down to their essence. It's this cut-to-the-chase quality that makes talking with her so rewarding. In a recent conversation, the topic of European versus American art was raised. The question was not which is better, but rather, how to tell them apart. "It's easy," Shechter said, "American painting is about observation, European painting is about Xerxes." In other words, a European painting refers to the cultural and art historical traditions that preceded it. An American painting is concerned with seeing and accurately rendering whatever is in front of the artist. If you look back at the history of painting in America you see that this is essentially true. The earliest artists are the limners who painted simple portraits. As time passed, artists with more sophisticated ambitions came along, but America provided a very limited market for their work. So, an artist like Benjamin West who wanted to paint history paintings went off to England early in his career to seek his fortune. While an artist like JS Copley--who painted more directly--found a market for his work in Boston; though Copley was eventually lured away by the bright-lights and social scene of London. 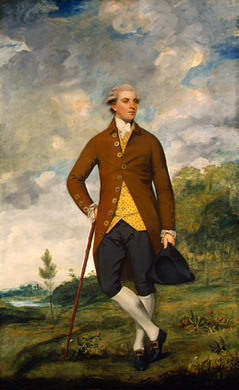 A look at an American portrait by John Singleton Copley (1737-1815) and a British portrait of the same period by Sir Joshua Reynolds (1723-1792) explains volumes about the fundamental difference in the paintings of the Continent versus the US. 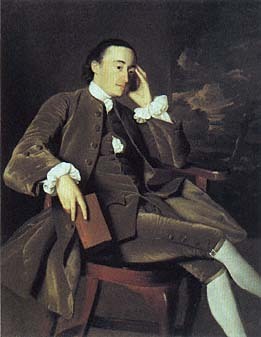 The Copley subject is just a guy in a chair; the Reynolds subject is a master-of-the-universe with all the glory of England and the history of art behind him. This difference applies to other genres besides portraiture. 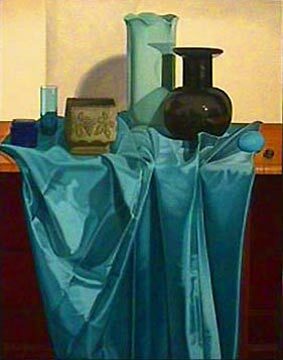 Consider the work of 19th century still life painter John Frederick Peto (1854-1907): Peto studied for a time at the Philadelphia Academy of Fine Art and showed occasionally in their exhibitions. 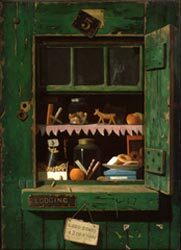 Peto painted such life-like compositions that they can almost be called trompe l'oeil (meaning that they could be mistaken for the real thing). Of course, Peto is remarkable not merely for his painting skill, but also for his choosing to portray very ordinary objects in such precisionist detail. In its narrow picture depth, open compositional structure and choice of subject matter, Peto's work prefigures abstraction and even Pop art. Compare Peto to his contemporary, French still life painter Henri Fantin-Latour. Also academically trained, Fantin-Latour was nonetheless very much a part of the lively art scene in 19th century Paris. Along with other renegades, Fantin-Latour boycotted the academy to show at the Salon des Refugées thereby thumbing his nose at the traditionalists. 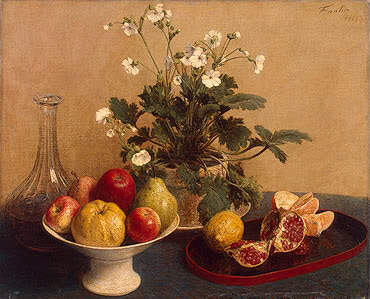 But in actually examining a Fantin-Latour still life, we see a rigid adherence to four centuries of perspective norms combined with a propensity to romanticize produce. Fantin-Latour, who was involved in everything trendy in Paris, seems tethered to the past--a victim of too much history. Even with firsthand exposure to European art, Ash Can School painter Edward Hopper (1882-1969) kept his distinctly American character. Hopper traveled to Europe twice during those artistically fertile years just before World War I. Hopper exhibited his work in the famous New York Armory Show of 1913--a show that included over 1000 examples of traditional and avant-garde European art. But Hopper apparently ignored these experiences still painting in an emotionally cool, simple and direct style. His theme was emphatically modern: the isolation of people torn from cozy, 19th century rural security and thrust solitary and alienated into an urban environment. 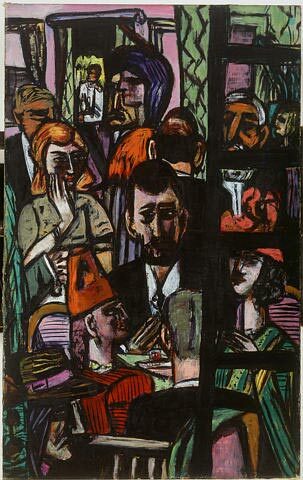 Hopper's contemporary, German painter Max Beckmann (1884-1950), painted modern man as alienated, too; visually his work is light years apart from Hopper's. In this late painting--made in St. Louis just after WW II--Beckmann shows a man surrounded by bodies, but emotionally isolated, with human foes on all sides. The claustrophobic space and high-contrast paint are disturbing and profoundly expressive. 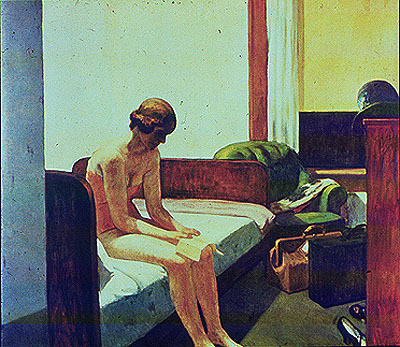 Hopper's loneliness is empty and detached; Beckmann's is a deeply personal despair. With the 1950's, the artistic cross-pollination driven by instant communications and the displacements of World War II make it hard, and not particularly useful, to try to differentiate Europe from the US. Many European artists fled in exile to New York and stayed in town to make their mark on the thriving New York art scene. With European art, a cigar is much more than a cigar. Jake Biddington works on The Street and is responsible for the opinions & information in INVESTING. Young Jake, as he is known within the virtual BIDDINGTON clan, views art, antiques and collectibles as stores of value similar to stocks or foreign currencies. He sees these items as another type of asset in which to place one's money. To that end he keeps price histories and charting information on various categories of objects. He views some items as long term investments, others as items for a quick trade--and he even sees some as short sales. Frankly, Jake's views incite considerable controversy within the family: His mother, Claire Biddington Rosetti, the curator of CREATIVE PROCESS, sees Jake's approach as part of the damaging "commodification" of art wherein the buyers of art comprehend only its financial value and are blind to its aesthetic and social significance. Cousin Randolph, (writer of EXPERT CONSULTANCY), sees the silver lining: For him, the informed expert wins because he can use his knowledge and judgment to buy superbly interesting-- what Jake would call "off-the-run"-- pieces at relatively cheap prices, because such items don't fit the narrow criteria for quick resale. Once the Bentley is safely garaged and he lounges sipping his second martini, Uncle Frederick Fieldhouse Biddington waxes inclusive: "Whatever gives collectors pleasure," he says. "Whatever amuses." BIDDINGTON'S BENTLEY--travel for the art connoisseur. MY ART--Art for kids.